A guy named Steven Goddard has posted today that Irene has nothing more than 33 mph winds and that NOAA’s hurricane warnings are phony. I read it just now on the famous Drudge Report. I can’t find Goddard’s credentials but a Google search does find that he’s been waging war against climate change theory for years now, which is neither here nor there. He’s currently denying actual data from weather stations in North Carolina. There are winds gusting to near 120 mph. The storm may destroy every boardwalk up the coast. Please, you are doing a disservice to our side of the debate by downplaying this. ITS A 951 MB LAND FALL… 6th strongest on record in NC. This is not a fight you should be fighting with these people. Lets not resort to the tactics they have ( warmingistas) by twisting examples. The exposure of some of the ob sites is leading to some of the reports, but other areas are getting hammered in the way this should 951 mb is similar to the pressure of IKE which was ridiculed before hand cause it was downgraded to 2. I beg of you guys. Make fun of me after if this is not a 5-10 billion dollar storm , but wait till the game is over because we are setting ourselves up for problems if we find the boardwalks destroyed and people without power for a week like I think. LETS FIGHT THEM WITH TRUTH on the facts .. Hurricanes are not caused by global warming, but lets fight them on the merits of the issue, not with examples, whether I am right on how this turns out or not! Goddard’s site, “Real Science,” is claiming that because Irene has been downgraded to a Category 1 storm and wind levels are lower than may have been anticipated, the hysteria is phony. Here are the facts: Most hurricane or tropical storm deaths are not caused by winds—they’re caused by storm surge; water piling up, driven by tides and currents and supplemented by extreme downpours. And even though Irene’s wind speeds are down due to how the storm has broken up over land, it still has the potential to spawn tornadoes. And even if Goddard is correct that maximum winds will be at 33 mph when the storm hits New York City, having lived on the 18th floor of a Manhattan high-rise for several years, I can tell you from first-hand experience, that wind speeds of 30 mph at ground level, can be twice that 15 stories up and well over 90mph above 30 stories. This strikes me as not the time to let political or scientific viewpoints on the veracity of climate change theory influence actual information people need to decide whether they’re going to evacuate or not. 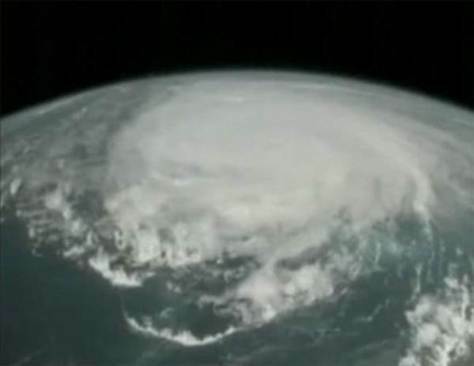 Regardless of her wind speeds, Irene is a massive storm, nearly the size of Europe and the storm surge and the threat of tornadoes alone should be enough to convince people to be safe and prudent in protecting their own lives and those of their families. Mr. Goddard is cordially invited to stand in the foot of water in my back yard under the oak tree that bends further with each gust and make his case right in the midst of NOAA’s phony hurricane. I’ll stand by at my back door with the chain saw, just in case he needs to be freed from one of the oak’s falling phony boughs.